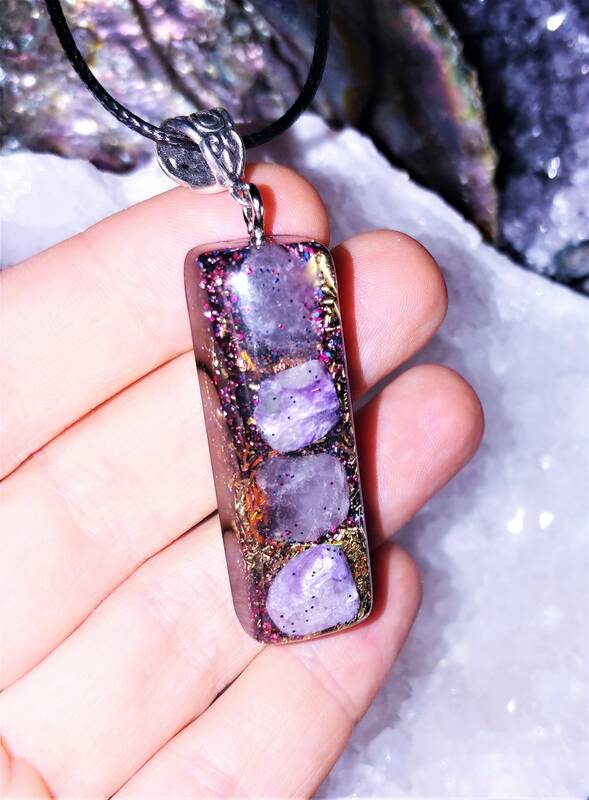 This Orgone piece can make a great accessory for any outfit, as well as add bohemian touch to your look, while serving as the greatest EMF protector, and positive energy generator. Crystals for this necklace were put together to bring in abundance into your life, enhance creativity, assist with spiritual growth, bring love and positive energy into every day of your life, protect from anything of negative nature.. It contains Charoite, Amethyst, Shungite powder, Sage Rose Petals, Mica Flakes, 24 K gold flakes, copper flakes, Metal shavings, Clear Quartz Crystal wrapped in copper wire for better conductivity, Copper coil, Black Sun Iron Oxide nano powder, highest jewelry grade epoxy resin. Comes on FREE 18" black cord necklace. Wearing this necklace will help you in balancing and harmonizing chakras, while connecting mind, body and spirit as one, activating your Chi channels and clearing all the negative energy in your body and around you. It will bring love, awareness and luck into your life. It is a third eye and crown chakra crystal, an extremely powerful and protective stone with a high spiritual vibration. It has strong healing and cleansing powers and promotes tranquility and inner peace. It can be both calming or stimulating, depending on what your situation calls for. Amethyst is a fantastic stone for enhancing intuition and psychic abilities. Charoite is called a "Stone of Transformation" and is a stone of power. In particular it transforms negative emotions such as anger and fear into positive feelings. As part of the transformation process it allows release of those negative emotions. Charoite is also a stone of inspiration, bringing enhanced creativity, spiritual growth, and showing new possibilities even in old situations. This is a stone that allows us to see clearly which brings with it enhanced self-esteem and helps release one from victimization. Charoite can enhance or bring courage, inner strength, and appropriate assertiveness. In the psychic realm, charoite is used for entity release or rescue work, clairvoyance, and prophesy. Physically, charoite is used in spiritual crystal healing for speeding up healing of all kinds, headaches, liver problems, alcohol detoxification, cramps, heart problems, eye problems, and nerves. Traditional symbol of love, rose petals also known as a symbol of inclusion, universal understanding and orde In mythology, rose meaning is associated with Aphrodite (Greek) goddess of love. You're pieces are amazing, and I know you put so much effort and love into them. I couldn't debate on which piece to buy. So I bought 2 of them they both were catching my eye. I really appreciate the kind, loving letter. much love and light back to you. keep doing the wonderful work you do.